Wayne State University's Athletics Department is gearing up for "W" Week, a community service initiative celebrating 36 years of women in WSU athletics. 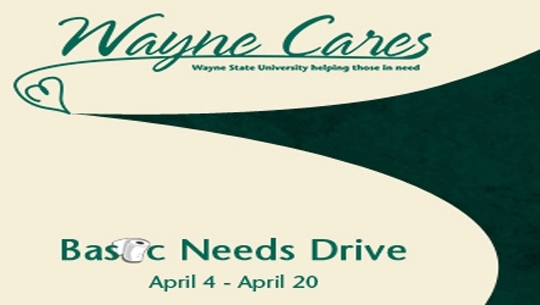 As part of the campaign, the Athletics Department has partnered with Wayne Cares, DO Foundation and Covenant House Michigan to organize a Basic Needs Drive, April 4-20. The groups will collect travel-size toiletries to be distributed to the homeless in areas surrounding Wayne State University during "W" Week, April 25-30. Additionally, donations will go to Covenant House Michigan for distribution to the youth they serve, as well as to the DO Foundation's "Hit the Streets" outreach mission. The goal is to collect enough items to assemble 1,000 toiletry kits for those in need. For a complete list of suggested donation items and drop-off locations, visit http://govaffairs.wayne.edu/cares/basic-needs.php or call Candice L. Turner at 313-577-3048.